Beautiful villages, green hills, forest, landscapes, lakes and mountains are the main attraction of this trip, beneath world’s 10th highest Mt. Annapurna at 8,091 m and 7th highest Mt. Dhaulagiri 8,167 m, , trekking around Annapurna and Dhaulagiri massive mountain range, dramatic variation from sub-tropic – Mediterranean, alpine to arctic climate temperature and landscapes, daily amazing panorama views with views of world’s 3 highest mountains over 8000m Annapurna-Dhaulagiri & Manaslu, fascinating traditional mid hills Gurung, Manang & Thakali tribe villages, visiting picturesque emerald Tilicho lake and crossing of remote high pass of Mesokanto -la. 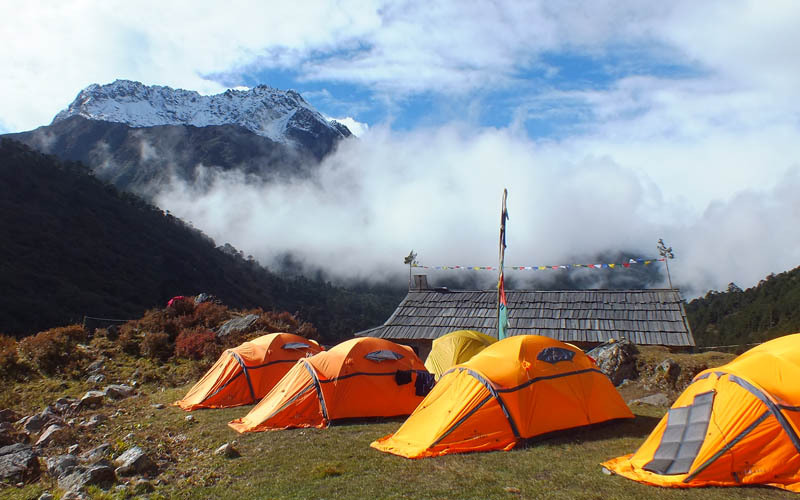 Tilicho Lake Trekking is slightly different than the usual trekking packages of Nepal. This trekking is an ideal choice for crossing the high pass. The scenic vegetation, lovely villages, highest lake and stunning mountains views are blessing the visitors. We Trexmount Ventures have formed the peculiar route to provide the immense feeling of mountain wilderness. 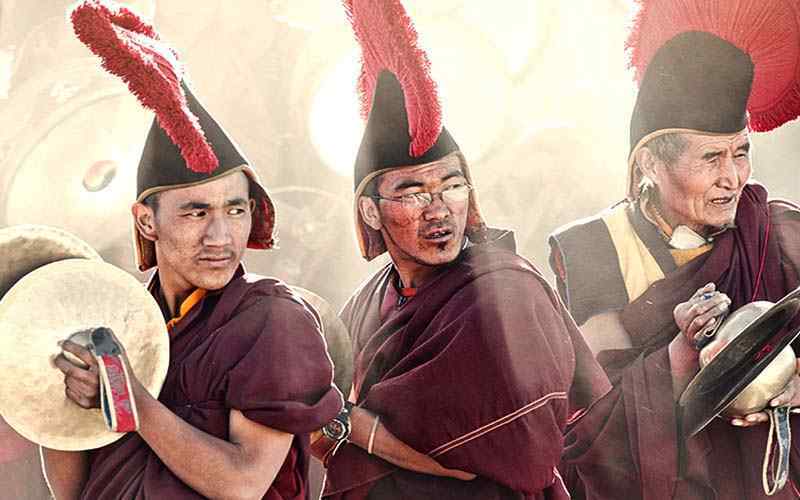 The diversity of the ethnic group, their social structure and unique traditional are making amaze to acknowledge. Tilicho Lake Trekking start with Trexmount Ventures private vehicle to Beshishar. The local vehicles will be hired here to drive further to Chamje. We will begin hiking journey from here with following magnificent Marshyangdi river valley. The journey is full of experience from different variation of landscape and unique settlements of highlander. The temperate forests start to fade paving way for alpine to more barren landscape of Manang Valley. The villages of Dharapani, Chame and Pisang are traversed before reaching the valley. Acclimatization rest will be taken in manang village with side hikes and strolling around this lovely village. Tilicho Lake Trekking heads to lefeside Tilico valley to reach Sirikharka via Khangsar Village. The Visitors will have different walking experience through bumpy moraine arctic type of trail to reach Tilicho Lake. The time spent on the shores of world’s highest Tilicho Lake makes an effervescent experience to gather. After the lovely time in Tilicho Lake and Tilicho peak base camp, we move forward to cross stunning Mesokanta La Pass (5300 m). You will make Circuit and get into other side and reach Kaligandaki valley. The lovely Thini village is waiting for you after the pass. 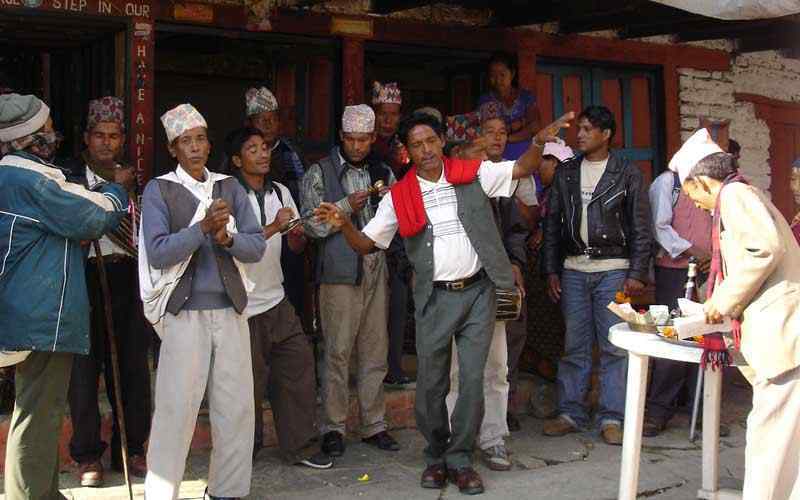 The village is in the vicinity of Kaligandaki River and one can feel the windy atmosphere. This Tilicho Lake Trekking is giving adventurous experience and different dynamic dimension of walking holiday in Nepal. 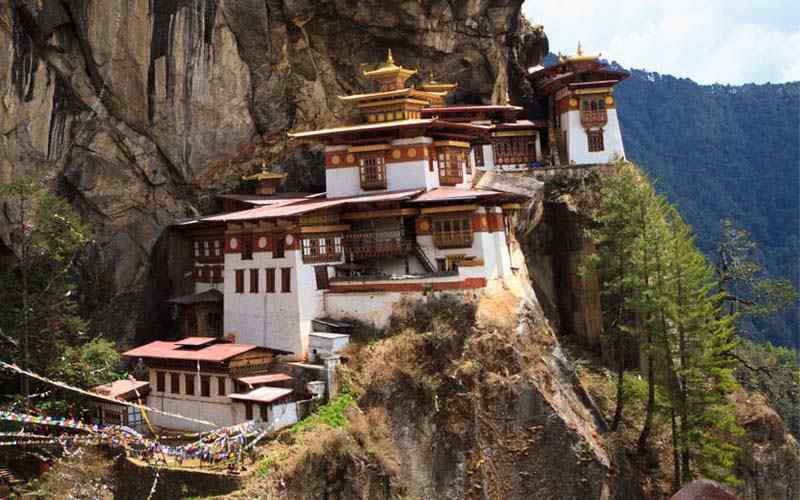 Exploring high Himalaya, spectacular scenery and unique settlements of highlander amaze the visitors smartly. Upon reaching Jomsom, We will take flight to Pokhara. Rejoice in the cool city pokhara before heading back to Kathmandu. Day 03: Drive to Chamje (1,560 m-5,118 ft) via Beshishar (823 m-2,700 ft) - 08 hrs . Day 04: Trek to Dharapani (1,920 m-6,229 ft) - 05 hrs. Day 05: Trek to Chame (2,670 m-8,760 ft) - 05 hrs. Day 06: Trek to Pisang (3,230 m-10,597 ft) - 05 hrs. Day 07: Trek to Manang Village (3,450 m-11,319 ft) - 05 hrs. Day 08: Free and rest day at Manang for acclimatization. 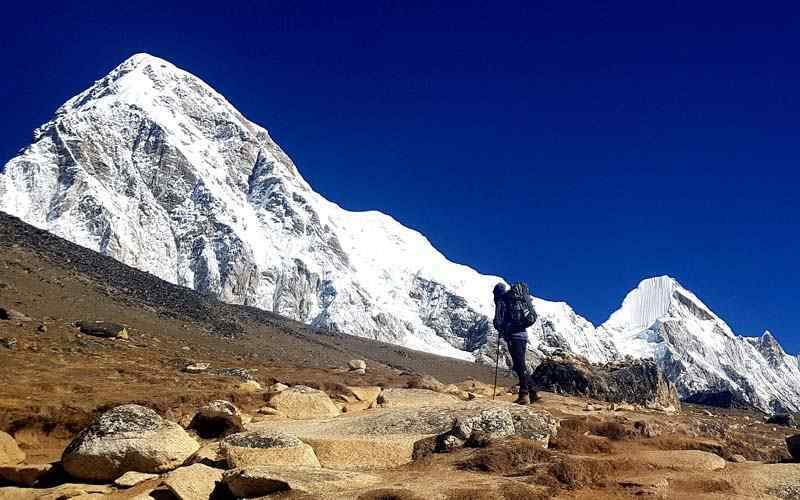 Day 09: Trek to Sri Kharka (3,840 m-12,598 ft) via Khangsar (3,734 m-12,251 ft) - 05 hrs. Day 10: Trek to Tilicho Lake (4,140 m-13,583 ft) - 03 hrs. 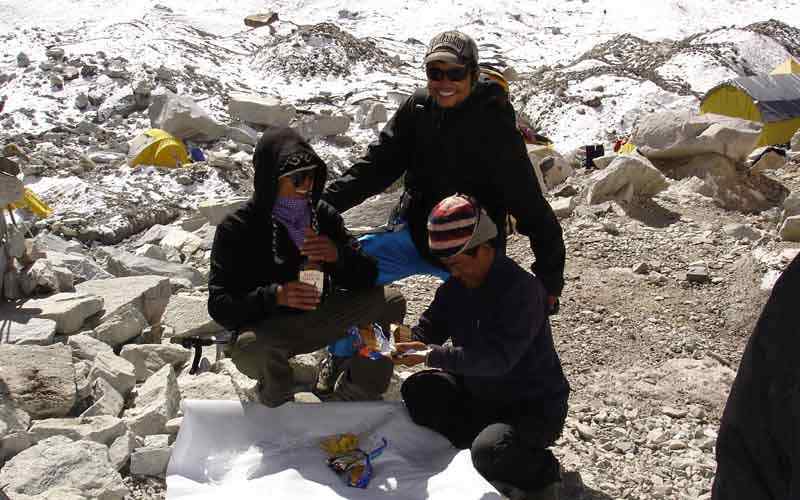 Day 11: Trek to Tilicho and Mesokanto Base (4,800 m-15,748 ft )- 04 hrs. 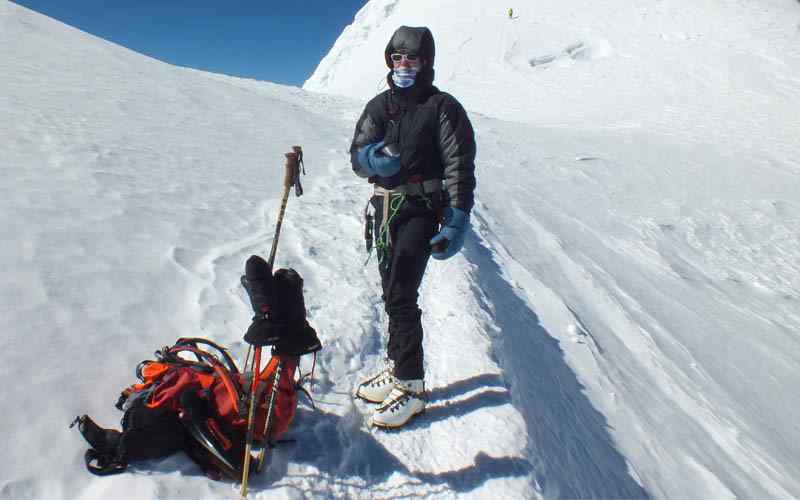 Day 12: To Nama Phu (3,510 m-11,516 ft) via Mesokanto La (5,099 m-16,729 ft) - 06 hrs. Day 13: Trek to Thinigaon (2,850 m-9,350 ft) via Kaisang (3363 m-11,033 ft)- 07 hrs. Day 14: Trek to Jomsom (2,713 m-8,900 ft) -03 hrs. Day 15: Fly from Jomsom to Pokhara (860 m-2,821 ft). After a first night in local lodge with homely hospitality, walk back to Marsyangdi River. View Annapurna, Lamjung and in the background, the Manaslu mountain ranges. Walk on a wide trail to the quaint village of Tal Besi. After few hours brake, walk to Dharapani village for an overnight halt. 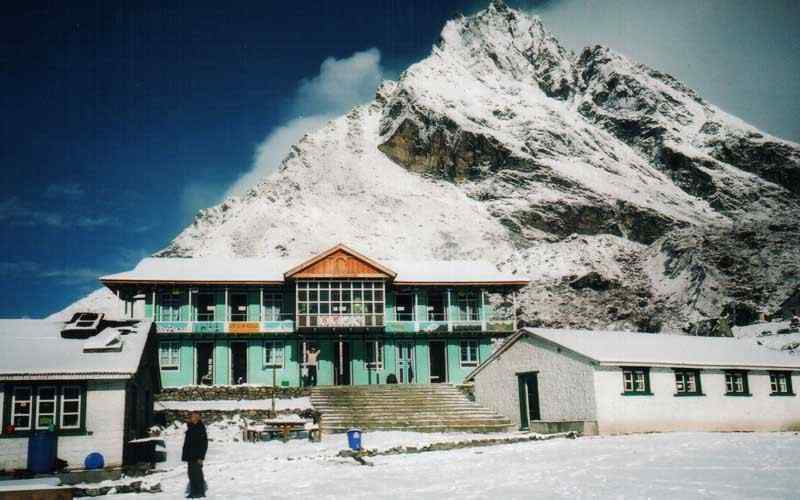 Dharapani is located on the mid way of around Manaslu and Annapurna circuit trek. Meals included: Breakfast, Lunch, Dinner. From Dharapani on-wards the temperature gets cooler given the alpine climate. Walk on a winding wide trail through serene rhododendron and pine woodlands through small villages of Bagachap, Danque. 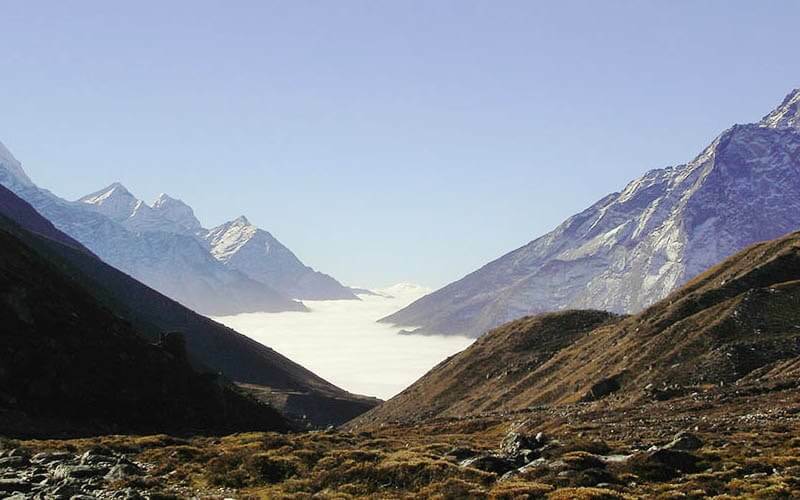 Climb higher to Timang village with super views of snow capped peaks toward the north. 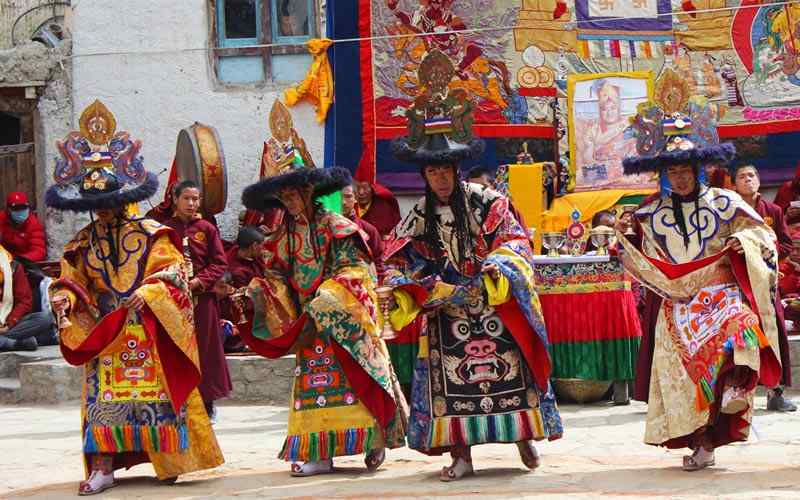 From this village on-wards be in the land of Buddhist tradition and culture. After an hours walk reach Koto and then Chame, a large town and the district headquarter of Manang area. Take time to browse around the streets of Chame with wonderful views of AII and Lamjung Himal. Meals included: Breakfast, Lunch, Dinner . From here on-wards feel the cool and fresh mountain air. Walk through an enchanting alpine forest of rhododendron and pine tree lines. Follow the Marshyangdi River upstream with several ups and downs to Bhratang village. 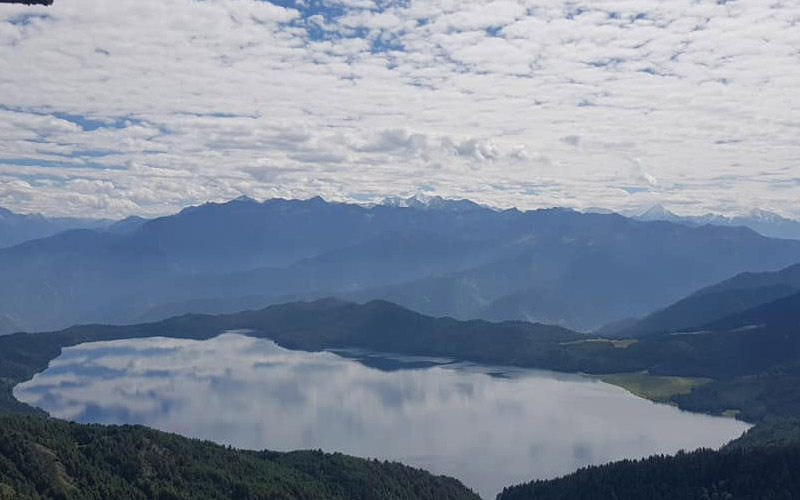 Walk uphill through the woodlands to Dhukure Pokhari with couple of tea houses and which gives views of Chulu’s and Pisang peak and of Pisang village. After a break descend to the lower Pisang village for an overnight stop. Spend the afternoon at leisure and rest as the high altitude starts from here on-wards. Meals included: Breakfast, Lunch, Dinner. Awake with wonderful views of snow capped peaks. Take a close look of A II North Face. Walk toward a hill through nice pine woodland. 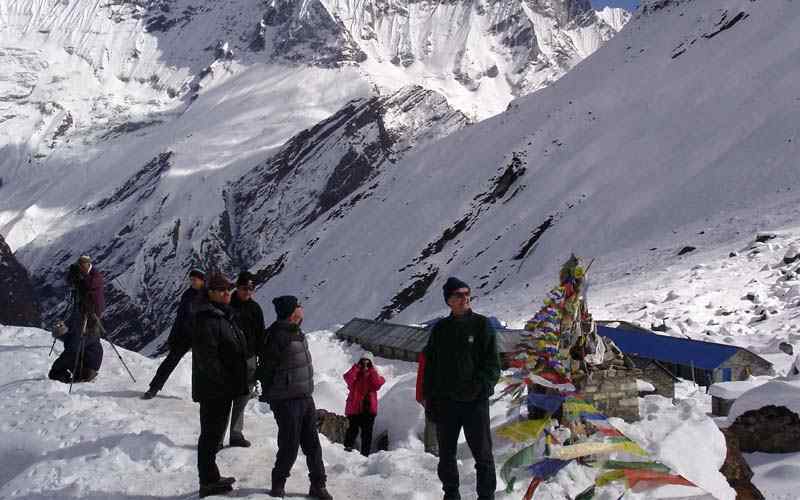 Catch awesome views of the Manang valley with surrounding high snow capped mountains. Head downhill towards Manang valley. 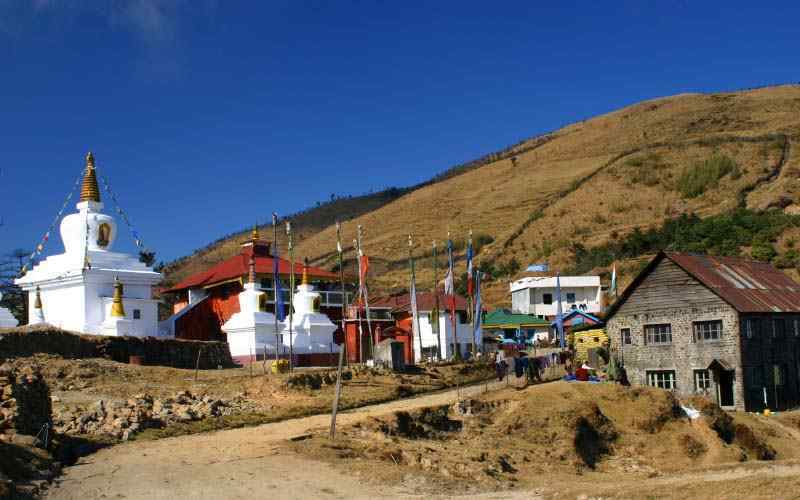 Reach Hongde village with a small airstrip (flight to and from Pokhara is only twice a week and unpredictable). The tree lines disappear into arid and barren landscapes with cold, dry climate temperature, however, there is sunshine during the day with strong UV in this thin air altitude. From here with constant views of snow capped peaks reach Braga which is close to Manang village. Visit the old Braga monastery with treasures of old Buddhist artifacts, relics and statues along with ancient amazing wall Thanka paintings (Buddhist religious painting) and frescoes. 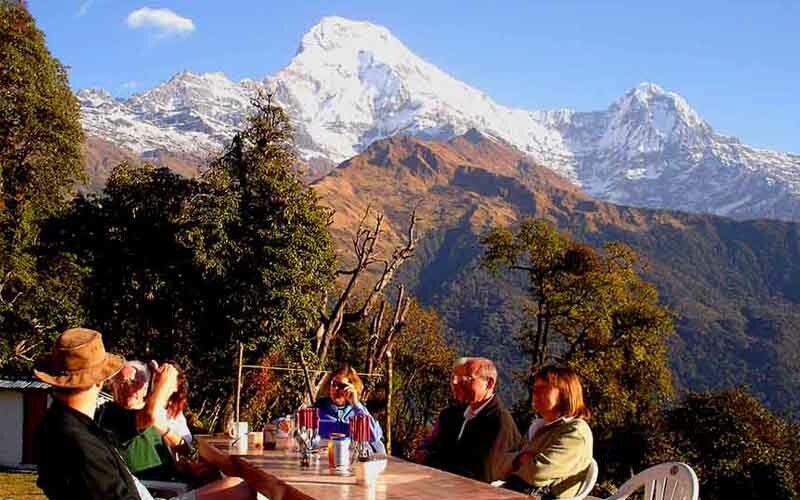 View breathtaking views of the Annapurna range with Chulus and as far to Manaslu towards east. Make a slow and steady walk to Manang village for lunch and overnight stop with alluring views of Gangapurna, A II and Tilicho peak and turquoise Manang lake nearby. Pisang and Manang houses are built in traditional Tibetan style as people of Manang practice rich Buddhist religion with attending culture and traditions. Meals included: Breakfast, Lunch, Dinner. A complete free and rest at Manang an ideal place for acclimatization which is essential at this altitude above 3,000 meters. Head a bit higher to Tilicho & Mesokanto-la pass. 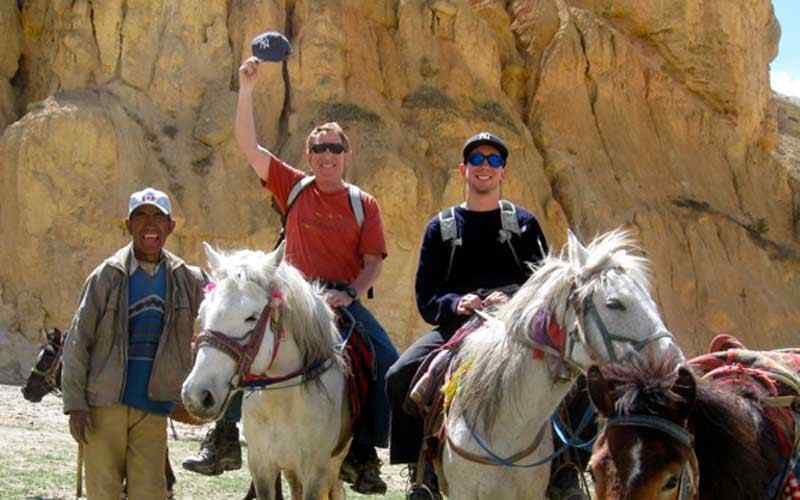 Manang offers various optional short hikes to Gangapurna glacier and Manang lake. (Ice Lake takes more than 5 hours both ways we do not recommend unless people are very eager or fit to trek on this rest day). Meals included: Breakfast, Lunch, Dinner. After a nice break and stop for two nights at Manang, the walk is easier on a gradual path passing the last village of Manang at Tenke. 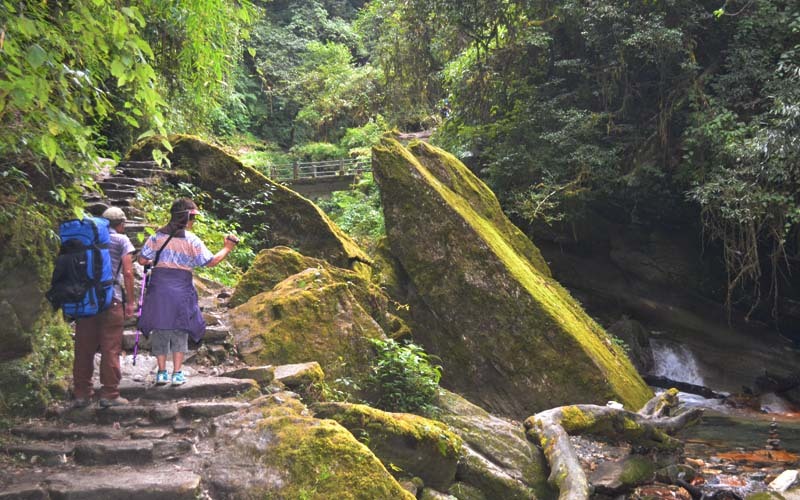 Enter complete wilderness with a gentle uphill walk and the leave the trail of Annapurna circuit towards Tilicho Lake. 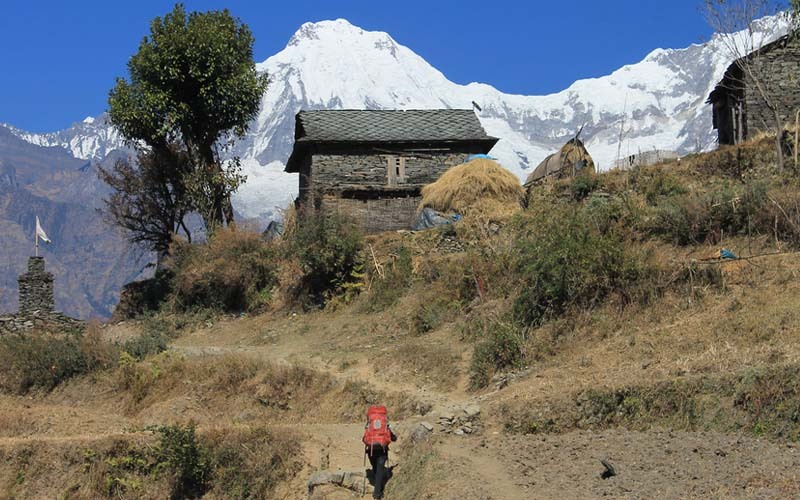 Walk past the small village of Khangsar to reach at Sri Kharka with a few lodges and with great views of Gangapurna and Tilicho Peak. Meals included: Breakfast, Lunch, Dinner. 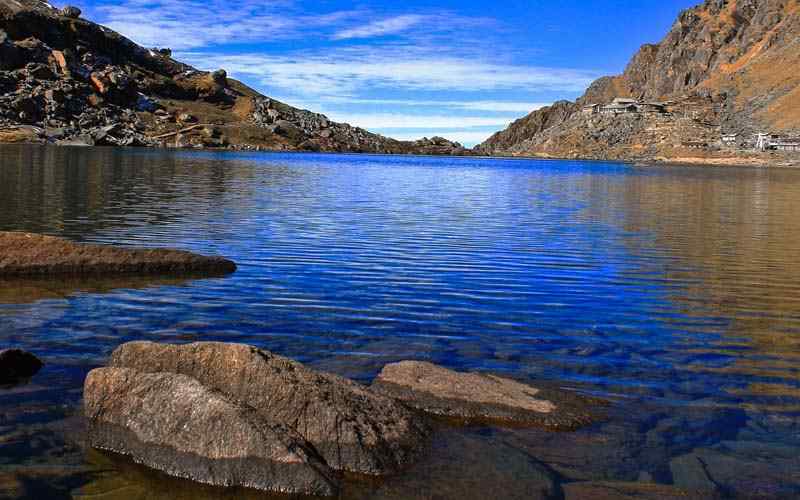 Today walk short distance in a couple of hours to reach Tilicho Lake. Find awesome scenery on this arid and dry region. Walk to up and down a gradual path on loose scree and rocks with few dwarf juniper bushes. End the morning walk at turquoise colored Tilicho Lake, regarded as holy lake for Buddhists and Hindus. Find in this wonderful area 2-3 lodges along the lake shore. 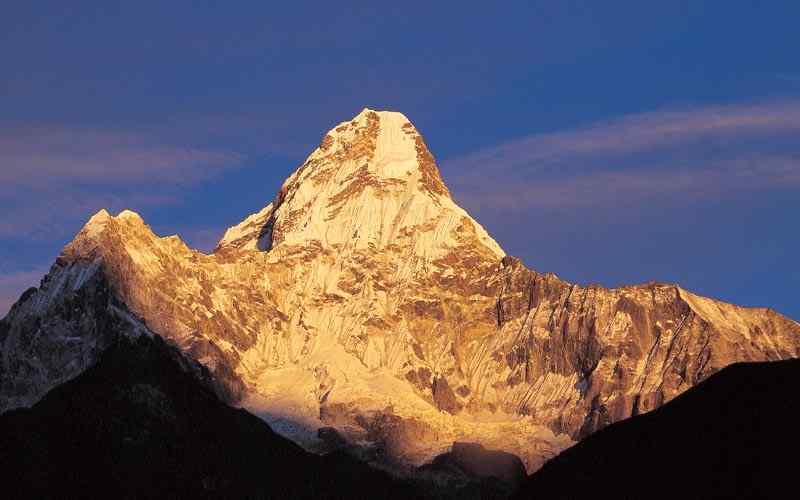 After lunch explore the surrounding area of Tilicho with amazing views of Tilicho Peak, Annapurna III and Gangapurna. Meals included: Breakfast, Lunch, Dinner. After a wonderful time at Tilicho, leave the last settlement. Now enter complete wilderness. Head further west for about four hours through this dry and mystical landscape. Then slowly walk to Namaphu, the base of high passes of Tilicho and Masokanto. These passes are above 5,000 meters. Overnight camp is set-up on the best available level ground with afternoon free to scout the route for next day. 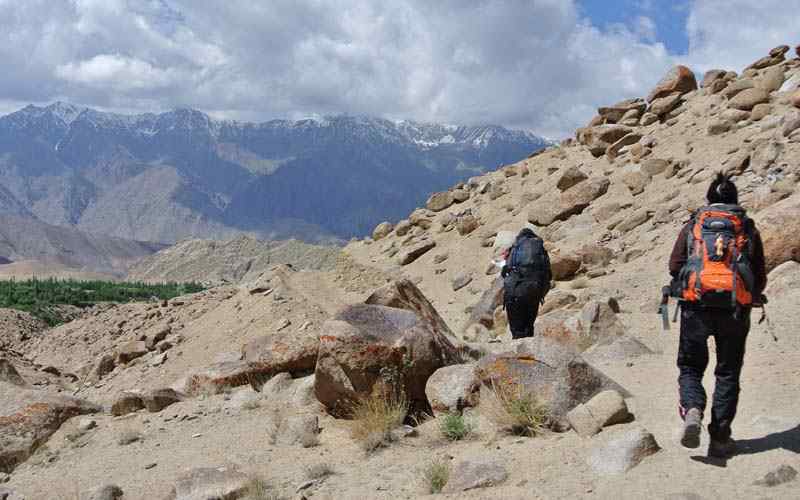 Possibly see some wildlife mountain such as antelopes, musk deer or the elusive snow leopards. Meals included: Breakfast, Lunch, Dinner. Start in early morning to cross and traverse the high pass. Climb up toward the higher ridge then traverse Tilicho pass. Take a short downhill path towards the base of Mesokanto pass. After a refreshing break slowly and steady walk the last high climb on a steep up to reach the top of Mesokanto–la the highest point of this adventure. Here experience a superb panorama of surrounding high peaks and valleys. Heading downhill towards the last camp at a small pasture called Nama phu for overnight stop after a good and hard day’s trek. Meals included: Breakfast, Lunch, Dinner. Today, walk back to human settlement to near Jomsom town at Thinigaon. After few days in total wilderness, walk on a downhill slope past a few cattle and yak herders, shelters of stone huts and pasture fields. Move on a pleasant path leading further downhill towards Thinigaon for overnight stop in the comfort of nice homely lodge. Thinigaon is another nice big village located opposite bank of Kaligandaki River from the town of Jomsom. Meals included: Breakfast, Lunch, Dinner. After a previous hard day walk, today enjoy a short and final trek of this wonderful adventure. Walk toward the Kaligandaki river, cross a long suspension bridge. 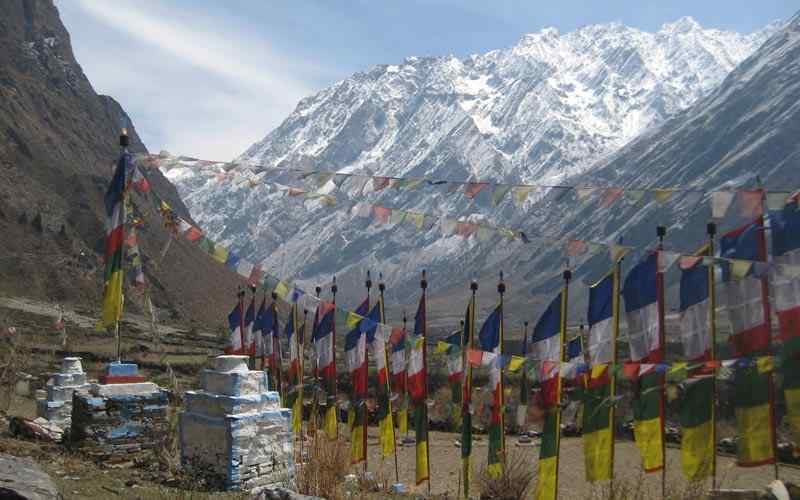 Reach Jomsom for last overnight stop of this trek in the comfort of good lodge or hotel with great food menu. Jomsom has a small airstrip above Kaligandaki River (operates daily morning schedule flight to and from Pokhara). At Jomsom enjoy the afternoon exploring the town and enjoy the best of apple products as Mustang area who does grow famous apples. Meals included: Breakfast, Lunch, Dinner. Today the last day in the high hills of Himalaya. Transfer early morning to Jomsom airport for the sweeping flight to Pokhara with alluring views of Dhaulagiri, Nilgiri’s, Annapurna and Machhapuchhare. This wonderful flight takes less than half hour to reach at Pokhara for overnight stop by the pristine Lake Phewa. Enjoy the time in the afternoon to browse around the lake side stores and shops and relax in this beautiful setting. Meals included: Breakfast, Lunch, Dinner. With great time in the high hill, villages and at scenic Pokhara morning transfer for an interesting drive back to Kathmandu, after a wonderful experience up in the high green hill and mountains of Annapurna, reach Kathmandu. Transfer to respective hotels with afternoon free at leisure. 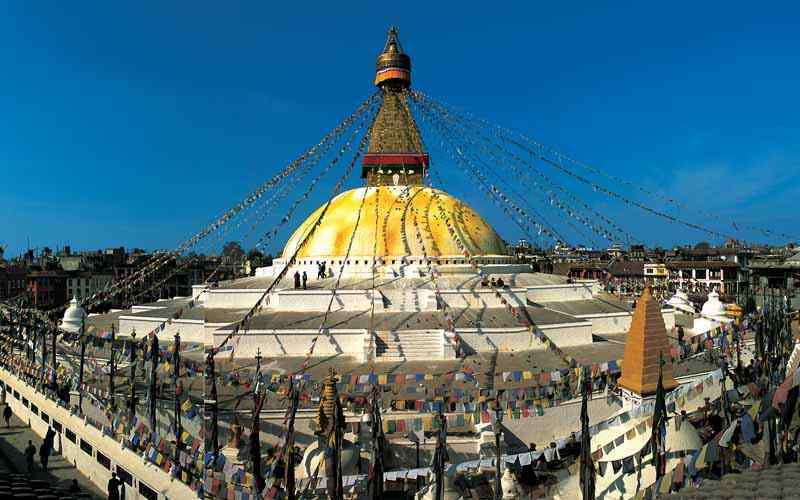 (For those who wish to fly to Kathmandu transfer to Pokhara airport with 30 minutes of scenic flight to Kathmandu, pay locally for the flight if you wanted instead of driving). Meals included: Breakfast, Dinner. Breakfast in the Hotel, Transfer to Tribhuvan International airport for departure towards your next destination. Meals included: Breakfast. Airport Pick up and drop transfer by car, van or bus depend on group size. Flight ticket from Jomsom to Pokhara. 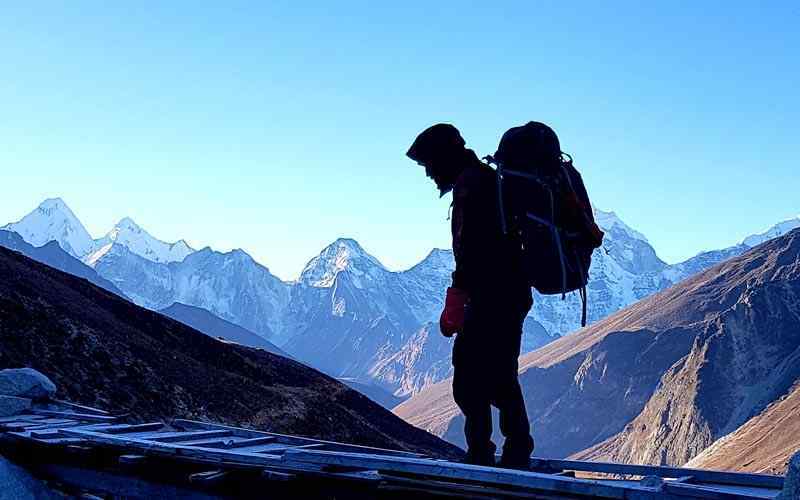 An experience guide and required number of porters (one porter in between two pax), their food, accommodation, transportation, salary, insurance, and equipment’s. 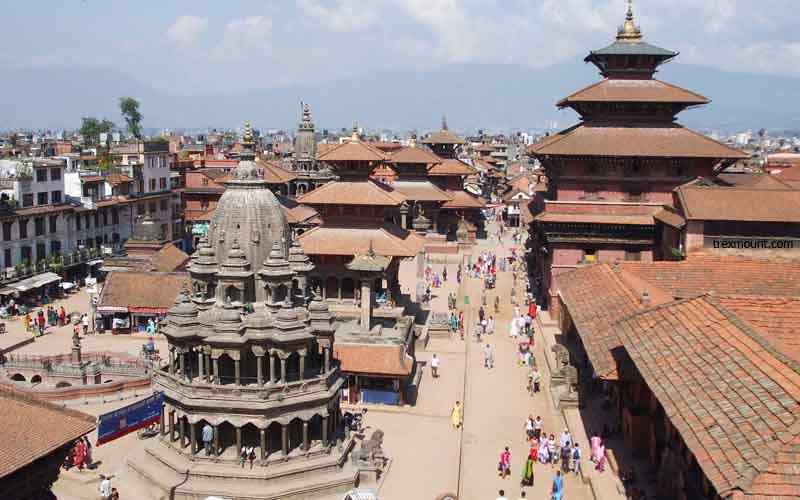 Temple and monastery entry fee, & entry fees while sightseeing in kathmandu & Pokhara.